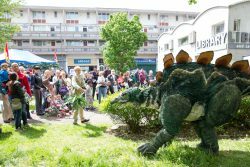 Hundreds of people got up close with a dinosaur on Saturday as part of the Wandsworth Arts Fringe. 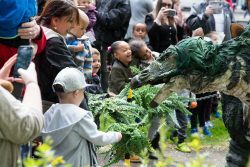 The Alton Goes Ancient event included a giant ‘dinosaur’, plus arts and crafts and other free family fun in the heart of Roehampton. The event was organised by Roehampton Outdoor Art Movement (ROAM), as part of Wandsworth Arts Fringe in partnership with Work and Play, ROCKS, Los Koas, and Wandsworth Regeneration. The Dash Arts Dacha – a 12-hour, ever-changing free performance venue housed at the Bedford pub, Balham. Modelled on a Russian country house, it featuring films, dressing up, board games and cards, live music, impromptu theatre performances, late night DJs and cooking sessions. A weekend of art, culture and music at All Saint’s Church, Tooting including exhibitions, workshops and a concert by the Gwalia Welsh Male Voice Choir. Show Us What You Look Like, Tooting. Express yourself through drawing and your artwork will be attached to the walls and floors of Tooting Market. People Show131: Putney Library. A site-specific promenade performance in and around the library. Twonkey’s Mumbo Jumbo Hotel. Surreal entertainment at the Cat’s Back from the comic, songwriter and puppeteer McTwonkey. Wandsworth arts Fringe is delivered by Enable Leisure and Culture on behalf of Wandsworth Council.